I picked this graphic novel up at last year’s Asheville Comic Expo and got it signed by writer/artist Mike Grell. I have to say that Mike was not the friendliest of the writers and artists I met that day, but whatever. Maybe he was tired or having a rough day. Anyway, it took me a while, but finally got around to reading it and overall I liked the book. I watched the “Arrow” series on TV but had never read any of the graphic novels. I must admit I was happy with this one and would certainly consider reading more in the future. For those of you who are unfamiliar with the story, the Green Arrow is Oliver Queen, and he is sort of like a cross between Batman and Robin Hood. I actually like that he does not possess any “superhuman” powers and relies on his physical strength and prowess. In this novel, he is aged and reflecting back on his life. It is during this time that a mysterious female assassin appears who also uses a bow. This woman is systematically killing members of a crime organization who have a shrouded history. What I found most interesting about the story is that the mysterious woman, known as Shado, is essentially the Jungian shadow aspect of Oliver’s psyche. She is able to kill without remorse, whereas Oliver struggles with moral issues, not wanting to take a life even though doing so is justified. The hits on the target are only the outward proof of your mastery… like the symbol of the dragon you bear – a symbol of dishonor. Both are meaningless. You have transcended goals. You are the artless art. You are Shado. Toward the end, when Oliver faces Shado, it becomes clear that the two are different aspects of the same self, symbolic mirrors of themselves. It is symbolic of Oliver facing that part of himself that he has sought to repress. Oliver: Why did you bring me here? Shado: You have been hunting me. At least this way I don’t have to wonder where you are. We are alike, you and I.
Oliver: No. I’m nothing like you. Shado: No? You want Magnor for what he did to that woman. I want him for what he did to my honor. How is your vengeance different from mine? I’d like to close this post by talking a little bit about the artwork. It’s very good. Most writers of graphic novels seem to rely on others to create artwork to accompany the story, but Grell handle both the writing and the artwork with equal skill. I was impressed with both, and the fact that Grell did all this on his own is a testament to his artistic talent and versatility. Then look I death my days should expiate. How can I then be elder than thou art? As tender nurse her babe from faring ill.
Thou gav’st me thine, not to give back again. This is an interesting sonnet about how we view ourselves, and specifically how we view ourselves reflected in the ones we love. It is one of the fair youth sonnets, so Shakespeare is addressing a young man. His love for the youth makes him feel young. We have a clear image of the older man, looking at himself in the mirror, and seeing himself as younger than he actually is. He knows that as long as he feels this connection to the youth and enjoys the happiness he is experiencing, then he will continue to feel invigorated. Love after all keeps us feeling young. Shakespeare acknowledges that this image he has of himself as being young is directly related to his feelings for the youth. As long as he continues to feel affection for the young man, he will feel young and energetic himself. But if his feelings begin to tire, and he starts seeing the youth as stale, hackneyed, and if his passion begins to wane, then his true age will once again show. He will lose the sense of rejuvenation that love has instilled within him. There is a definite correlation between our emotional state and how we view ourselves. When we are happy, content, joyous, then we see ourselves in a positive light, emanating the feelings that are within. Likewise, when we are sad, depressed, or lonely, then we see ourselves as old, tired, ugly, and so forth. Thankfully, I am happy right now in my life, and as I look in the mirror, I like the person I see. I hope your reflection makes you happy too. Cheers and blessings! As I read this poem, I couldn’t help but think how little has changed in 500 years. We are still obsessed with physical beauty. The opening line states the obvious—we desire sexual relations with those who possess physical beauty. But the word “increase” ties in with the next several lines. Humans not only desire physical beauty in their partners to satisfy their own pleasure, they also seek attractive partners so that they can pass the traits of physical beauty on to their children, thereby creating a fair bloodline. This was probably more important in Shakespeare’s time when upward mobility along the social ladder was usually gained through advantageous marriages. Having a beautiful daughter could certainly score you a nice dowry. The middle section of the poem has an interesting shift. Here we see the obsession with beauty from a woman’s perspective. 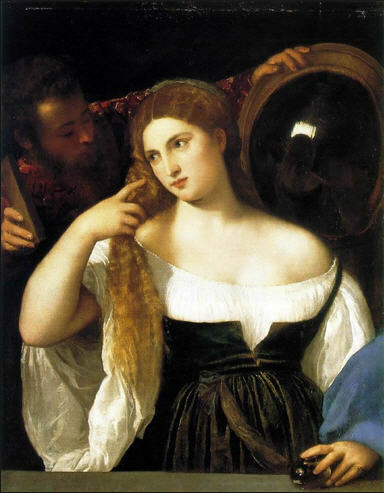 The woman is “contracted to thine own bright eyes,” or obsessed with her reflection in a mirror. She knows that if she is to secure a husband, she must do so while she still has the beauty of youth. She examines every aspect of herself and ornaments herself in order to highlight her appearance. The ending of this sonnet has a dark, ironic twist. While we may focus on beauty, procreation, and securing our lineage, ultimately, we all face the same end: death. Our flesh will rot and we will become food for the worms. Which begs the question—Is it worth it? I’d like to say it’s not, but I have to be honest with myself. There are advantages to being good-looking. It would be naive to think that unattractive people have the same workplace opportunities as attractive people. While I think we have made progress in this area, your appearance will still have an impact on the opportunities that are presented to you. I wish I could say we have evolved past this, but alas, tis not so. We may have come a long way as a society, but the fact is, human nature is very slow to change.